to know that she’s truly a 21st century diplomat. As the most traveled secretary of state in U.S. history, she’s been to 112 countries and traveled almost one million miles over the last four years. So how is the world’s busiest diplomat spending one of her last days on the job? On YouTube, of course. Tomorrow at 9:30 am ET, YouTube will live stream the Secretary's Global Townterview (think: town hall meets interview) from the Newseum in Washington, DC. She’ll answer questions from youth in Africa, Asia, Europe, the Middle East, and South America and is taking questions via social media as well (find details here). Tune in to the Department of State’s channel to hear about Secretary Clinton’s global adventures during her last week as secretary of state. Who knows? Maybe you’ll get a few tips on mastering jet lag, too. You don’t need to text with "Hillz" to know that she’s truly a 21st century diplomat. As the most traveled secretary of state in U.S. history, she’s been to 112 countries and traveled almost one million miles over the last four years. So how is the world’s busiest diplomat spending one of her last days on the job? On YouTube, of course. kicks off this weekend, celebrating innovation in independent cinema and introducing creative talent to the world. Can’t make it to the festival? In The Screening Room, a YouTube channel curated by Sundance Institute and dedicated to showcasing ambitious and entertaining short films, you can watch 12 short films debuting at Sundance right now. These films were selected from the 64 shorts showing at the festival, out of more than 8,100 submissions this year. Sundance is known for its diverse range of films, and with everything from trippy cats and zombies to a rooster king and an ambitious rodeo cowboy, The Screening Room shorts are no exception. When the festival ends, Sundance Institute will continue to curate The Screening Room, highlighting cutting edge short films from past Sundance filmmakers and the film festival circuit each week. Lucky enough to be in Park City? We’re here too, presenting the 2013 Sundance Film Festival Shorts Program, where we’ll introduce original content from select YouTube channels to the audience at each screening. At YouTube, we're proud to show our support and admiration for independent creators through our partnership with Sundance, and we hope you enjoy all the exciting new short form content that is uploaded to our platform every day. It’s that time of year, film buffs! The 2013 Sundance Film Festival kicks off this weekend, celebrating innovation in independent cinema and introducing creative talent to the world. All those recipes for hot wings, multi-layer dips and things-wrapped-in-bacon that you’ve been searching for? The Ad Blitz Pre-Game channel has them all in one place with videos on party recipes and ideas. We’ve also curated playoff coverage and predictions for the Big Game, so you can sound like an expert. There’s even a video on how to freeze a six-pack in under three minutes, in case you’re stuck with warm drinks at kick-off time. Ad Blitz Pre-Game is presented by Tide, and features sports content from channels like FOX Sports and Bleacher Report, plus great food suggestions from party-planning experts like Howcast and FoodWishes. The Pre-Game runs through February 2, after that you’ll be able to watch and vote on your favorite game commercials on the same Ad Blitz channel. Whether you’re really invested in the outcome of the game, or even more excited about all the snacks, we hope you’ll have something to cheer about. You don’t have to be an American football fan to know that the Big Game is almost here. It’s one of the biggest sports moments of the year, and we’re doing our bit to share the authentic Big Game experience, with the Ad Blitz Pre-Game program. , we’re excited to introduce you to four popular and promising partners so you can help them grow their audience and channels. Our January nominees include a filmmaker, a cupcake artist, a vlogger, and a singer-songwriter, and you can help jumpstart their YouTube careers. 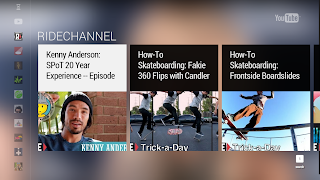 Review their videos below, vote for your favorite here, and one of these candidates will have the opportunity to be featured across YouTube later this month. In addition to your votes, each channel will be evaluated on criteria such as viewer engagement and channel optimization techniques to decide which partner we’ll feature. In past months, featured On The Rise partners like RichardGaleFilms and polcan99 have gained many subscribers and seen their careers take off, in large part due to your support. This month’s poll will be open until January 18, 5pm PT, so don’t forget to vote for your favorite channel. Check back to see which channel will be featured on January 30. You don’t have to have spent years in the kitchen in order to create professional-looking cupcakes or cake pops - and you don’t even have to travel to the Gold Coast to try them! Australian baker extraordinaire Elise will teach you how to make your own sweet treats with her step-by-step instructional videos. Tris of TristopiaTV is a British vlogger who shares his thoughts and comments on a wide range of topics on his weekly vlog show, T-Time. Check out his channel to listen to his views from everything from the nationwide fascination with tea to the world ending. A self-described “musician and hopeless romantic,” Tom hails from London and shares original music and covers of some popular songs with his audience via his channel. He writes and composes his own music for songs like “Pavement Sleeper” and puts his own spin on works from Bob Marley and Lana Del Ray to name a few. If you’re interested in participating or have suggestions for partners you think should be featured, you can nominate a YouTube partner to be considered for the “On The Rise” program. In our monthly On The Rise program, we identify four partners whose channels are seeing significant growth but haven’t yet reached the 100,000 subscriber mark. This month, with your help, we’re excited to introduce you to four popular and promising partners so you can help them grow their audience and channels.